The underlying technology in the LTS was originally developed in collaboration with the Department of Defense for use in communications between jets flying at MACH speeds and ground control. Over a decade of research and millions in funding behind it, the Celeras LTS has been unleashed onto the commercial markets for telecommunications usages. The LTS can maintain near 100% availability in all inclement weather. It simulcasts the data across two frequencies (MMW and laser) and selects the best packet in real time using Dynamic Packet Resourcing (DPR) thus enabling fiber-like availability at wireless speed. The laser and the MMW have mutually exclusive attenuation properties. The weather that causes the MMW to fade, does not affect the laser, and vice versa. This enables the radios to transmit 2Gbs of throughput in ALL weather instances. 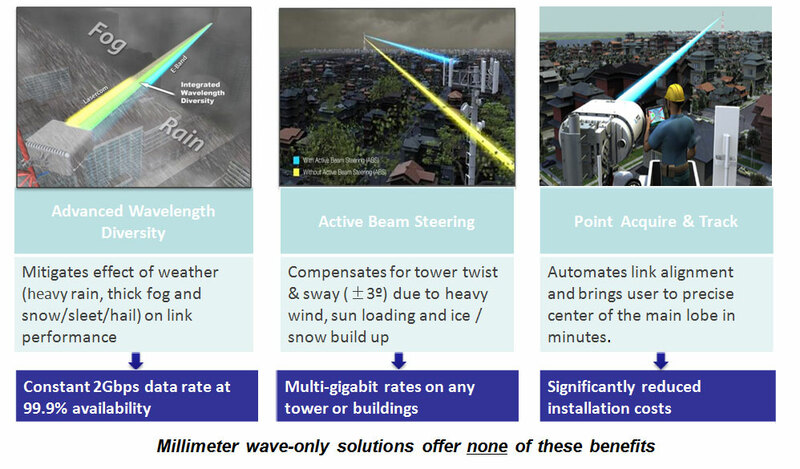 AAnother benefit the LTS has over the competition is its ability to compensate for up to ±3°of tower twist and sway. This enables us to deploy these radios on non-conventional structures and take advantage of towers at heights where other radios cannot. When deployed across our FCC registered shortest path routes, the LTS delivers unbeatable speed. The radio itself minimizes propagation and node switching delays, with a non-buffering layer 1 packet technology. The LTS utilizes automated precision link alignment. The Point-Acquire-Track™ (PAT) process takes minutes to lock onto the exact center of the main lobe, minimizing installation costs and guaranteeing maximum performance. This, along with Anova’s proprietary pathing software, facilitates expeditious link deployment once sites have been permitted.